Fresh out of Grad school, with a Masters in Information Systems, I started weighing my options on selecting a career path. All I knew was that I loved exploring the different streams of technology! So I began to look for a job that would provide flexibility to expand my horizons as I worked on projects. A Tech Consulting job fits perfectly into the bill, although I did not pay close attention to the many pros a consulting job would offer. Now that I have spent two years as a Tech Consultant and worked on building Data Warehouses, Analytic Dashboards and currently architect Big Data solutions, I feel every person choosing a new career has to consider consulting! Latest Tools and Tech – One of the biggest advantages is that you are updated on any new technology or tool coming into the market. Either your coworkers are talking about it or you get to use them on client projects. At the end of the day, you are ahead of the curve which is a big plus. Hands-on Practice – Adding to the previous point, as consultants you have access to a plethora of technologies, in order to learn and provide the best solutions to clients. This gives you access to services that would otherwise cost a fortune or have complex infrastructure that needs to be set up. Fast Paced Learning – Companies in all industries are dependent on technology to a large extent; most product-based companies would prefer to have consultants to come in and help build a technology-based solution. Building a solution in the limited project time makes the learning process fast-paced. By the end of the project, you would have learned way more than you thought! Training and Certification – There is a continuous focus on training and certifications, which is basically a measure of the knowledge you have on a particular service. A lot of the times consultants get trained by experts on certain technologies, which is extremely helpful when you have limited time to do your own research and need a quick start. I can’t stress enough on the fact that your profile will have way more value when you have certifications added to it. Whether you are starting a new project or looking for a new job, certification instantly puts you on the radar. As a consultant, you are expected to renew and update your certifications from time to time, adding more weight to your technical skill set. Time management – While I don’t have to travel to the client location every week, consultants, in general, spend a lot of time in the air. With a hectic schedule composed of traveling, working with the client and working on your personal projects, your time management is put to test. As you get into the rhythm, you learn to dedicate time for each of the activities and manage your time to be more productive. It is definitely the best byproduct of a hectic schedule! Subject Matter Expert – Working with client teams adds value at so many levels. The opportunity to work with clients in the different industry gives you an overview of both business aspects and technology stack that works well for a specific requirement. When you are moving up the ladder to managerial roles this acts as a catalyst. Mentoring – When you work on different projects, you get to learn from the working styles of various teams. With the exposure, you can validate what methodologies work better and implement them in future endeavors. In the process, you get to meet stakeholders with strong technical and/or people managerial skills, whom you can look up to as mentors for future learnings. You never know where you can build long lasting relationships! Lastly, working with dynamic teams in different environments sets you up to be a good team player. Networking Events – You get the opportunity to attend a lot of networking events, whether it is hosted by your firm or a client or other conferences. Networking events are good for meeting prospective clients and vendors, learn what is happening in the market, the current trends and which tool/technology you need to focus and build your skill set to be up to date in the market. 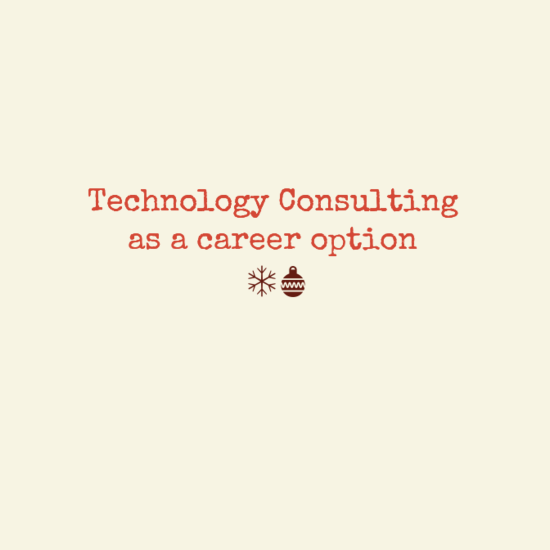 Starting your career as a Tech Consultant will definitely ramp up both your technical and business skills. You learn how to effectively manage teams and work with changes easily. As for technical knowledge, you are an expert even before you know it; with so much learning going on, given the short duration of projects. The travel perks are something I did not stress about since everyone is familiar with the advantages of flying frequently and visiting new places! You can reach us at decodergirlblog@gmail.com, in case of any queries.